In the cloud era, managing Windows users is not easy. This has driven many organizations to no longer utilize Microsoft Active Directory. These organizations have shifted their infrastructure to the cloud with solutions such as Google Apps for Work, Office 365, and AWS. IT has been implementing these cloud-based systems time and time again as they’ve had to look outside of AD for solutions to their cloud-computing challenges. The result of that was less pressure on leveraging Windows as the core IT platform. Coupled with the popularity of Linux servers and user preference for Macs, organizations have turned their once homogenous infrastructure into heterogeneous environments. How do you manage user access to all of these different platforms? Originally, organizations leveraged Microsoft Active Directory to manage user access to Windows machines and applications. Since most, if not all, of an IT environment was Windows, the decision to have a Microsoft solution handle user access control made sense. Over time, however, IT started to leverage a wide variety of platforms, including Macs and Linux devices. Google Apps and Office 365 became a part of the IT productivity stack, and the data center moved to the cloud with AWS. All of these various systems made it difficult for Active Directory to control and manage these resources. As a result, many organizations started to search for an Active Directory alternative. There were some must-have requirements for the Active Directory replacement. It needed the ability to centralize user management across Windows, Mac, and Linux platforms. It also had to handle Windows and AD user and device management, SaaS applications, and cloud infrastructure. The solution to this problem is Directory-as-a-Service® – a cloud-based, SaaS-delivered directory service. 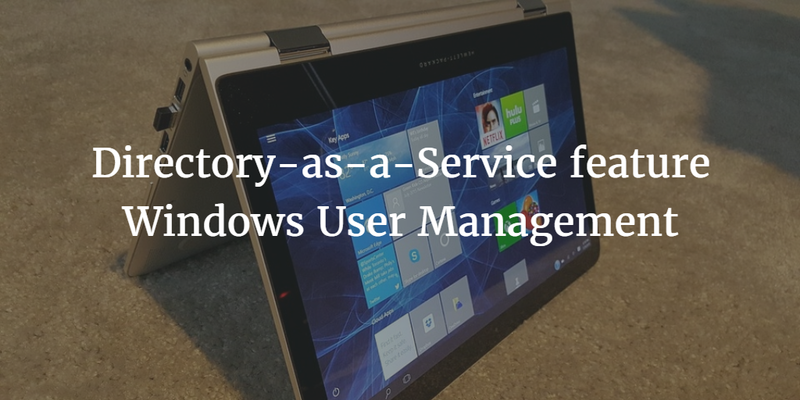 A core part of the Directory-as-a-Service platform is the ability to manage Windows users. Let’s look at how Windows user management works, shall we? A lightweight agent is placed on each Windows system. A central web console controls user creation, termination, and modifications. Users are created locally on each device through groups; all users that need access to a particular device are included. Once Windows users have been created, IT admins can specify password complexity requirements such as length, characters, reuse, and rotation. Another significant benefit is that users’ Windows logins can be leveraged to access other IT resources, including systems, applications, and networks. The ability of JumpCloud’s Directory-as-a-Service to manage Windows users is a core part of the cloud-based directory platform. But JumpCloud’s ability to extend those user management capabilities to Mac and Linux devices as well reflects a long-awaited change in directory services. As organizations move to mixed environments, this ability will become expected – and it must occur from a single web-based console. This is already possible with Directory-as-a-Service. If you would like to learn more about how JumpCloud’s cloud directory can centralize your user management, drop us a note. Please sign-up for a free account. Your first 10 users are free forever.